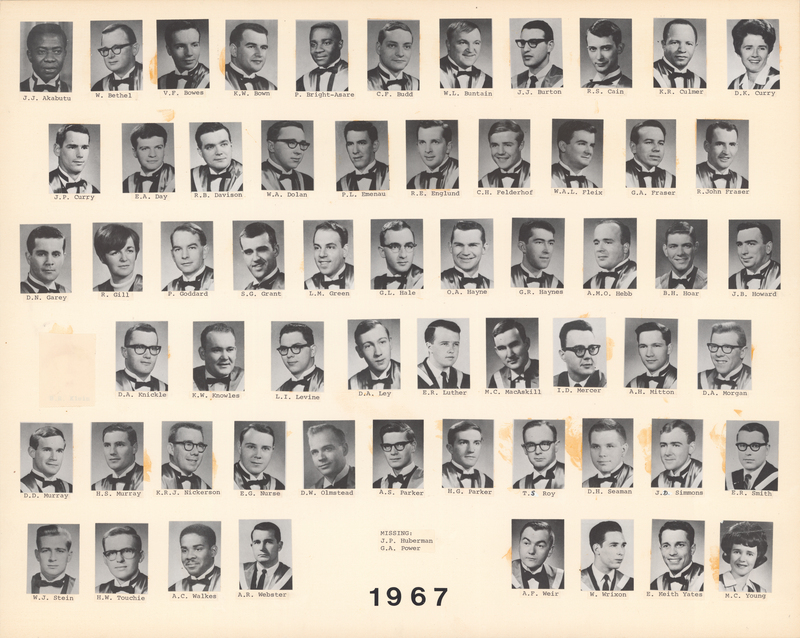 File is a composite photograph the Dalhousie Faculty of Medicine graduating Class of 1967. 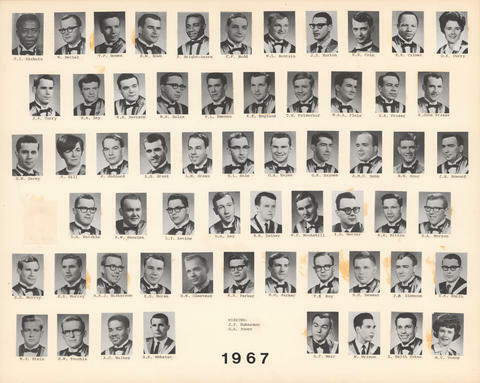 Photograph includes 61 individual portraits mounted on cardstock. Portraits include: J.J. Akabutu; W. Bethel; V.F. Bowes; K.W. Bown; P. Bright-Asare; C.F. Budd; W.L. Buntain; J.J. Burton; R.S. Cain; K.R. Culmer; D.K. Curry; J.P. Curry; E.A. Day; R.B. Davison; W.A. Dolan; P.L. Emenau; R.E. Englund; C.H. Felderhof; W.A.L. Fleix; G.A. Fraser; R. John Fraser; D.N. Garey; R. Gill; P. Goddard; S.G. Grant; L.M. Green; G.L. Hale; O.A. Hayne; G.R. Haynes; A.M.O. Hebb; B.H. Hoar; J.B. Howard; D.A. Knickle; K.W. Knowles; L.I. Levine; D.A. Ley; E.R. Luther; M.C. MacAskill; I.D. Mercer; A.H. Mitton; D.A. Morgan; D.D. Murray; H.S. Murray; K.R.J. Nickerson; E.G. Nurse; D.W. Olmstead; A.S. Parker; H.G. Parker; T.S. Roy; D.H. Seaman; J.L. Simmons; E.R. Smith; W.J. Stein; H.W. Touchie; A.C. Walkes; A.R. Webster; A.F. Weir; W. Wrixon; E. Keith Yates; M.C. Young.